In this contemplative novel, recently widowed Max Morden returns to the small Irish seaside resort where his family used to live when he was a boy. It was there he met and became fascinated by the Grace family, much above his own in social strata. Max’s memories are assisted by his residence as a boarder at The Cedars, the house where the Graces stayed that summer. The Cedars has become a boarding house that is now managed by Miss Vavasour. The young Max became the companion of the Grace’s oddly feral twins, Chloe and Myles. They are two very unpleasant children who torment their teenage nanny Rose. At first infatuated with the voluptuous Mrs. Grace, Max eventually turns his attentions to the spiky Chloe. Through his memories of the extraordinary events of that summer and his feelings about his wife’s death, Max eventually gains some self-knowledge. Looking back, he also gains some understanding of the dynamics between people that he did not grasp as a child. The Sea is stylistically exquisite, with its sussurating and rhythmic prose a striking meditation on death, grief, and memory. Although I guessed one of its revelations much earlier than intended, that did not take away from the power of the prose. I am in the midst if reviewing this book and I adored it- I thought of it as a kind if reverse-trauma, where we don’t find out the source of the trauma until right at the end (although, like you said, you can kind of guess what it is!). I also loved all the subtle water imagery, which reminded me of some of Virginia Woolf’s writing. 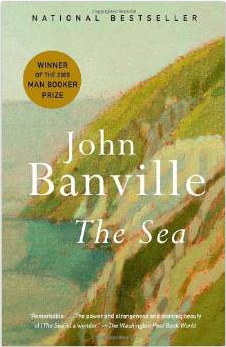 Did you read the interview with John Banville at the end if the book? (It was in my Piacdor 2005 edition) It was really fascinating! I don’t think the interview was in the back of my book. I’ll have to look for it.